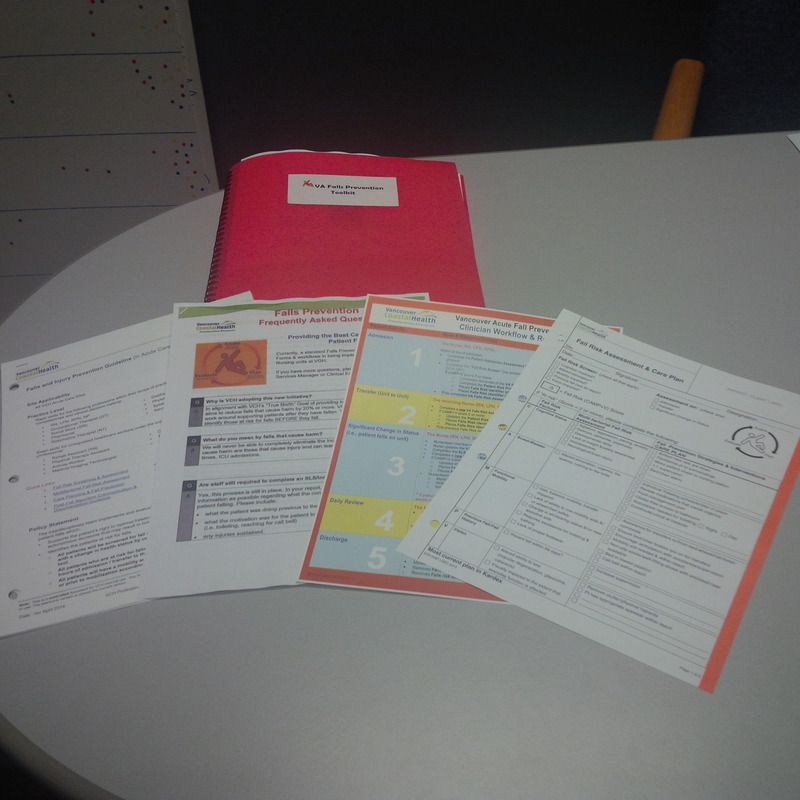 Earlier this year we introduced the Vancouver Acute (VA) Falls Prevention Team and their new Falls Prevention Toolkit at Vancouver General Hospital (VGH). At that time, the team was just beginning to rollout the Toolkit to the medical, surgical, cardiac and neurosciences units at VGH. Implementation then spread to the acute care units at UBC Hospital, the psychiatry units at both hospitals, as well as the VGH STAT Centre, medical daycare and perioperative services at VGH. By June, these VA sites and services had the Toolkit in place and staff had been trained to follow new standards for falls prevention and screening. The new Toolkit meets the recommendations made in Vancouver Coastal Health’s (VCH) Falls and Injury Prevention Guideline for Acute Care, and Accreditation Canada’s standards for the Falls Prevention Required Organization Practice (ROP). This initiative has been a huge undertaking for the Falls Prevention Team and many VCH staff, especially when you consider that Vancouver Acute employs nearly 5,000 full-time staff. So, we wanted to know…is the Toolkit improving patient safety and quality of care? To learn more we caught up with Tanya Dunne, Regional Fall and Injury Prevention Program Lead, and Joan Chocholik, Vancouver Acute Project Manager. Each provided some insight about how far they’ve come and how their most recent accreditation survey presented the catalyst for change. Now, with the Toolkit in use across VA sites and services, care providers can refer to standard guidelines and tools, making falls screening and prevention consistent from patient to patient. 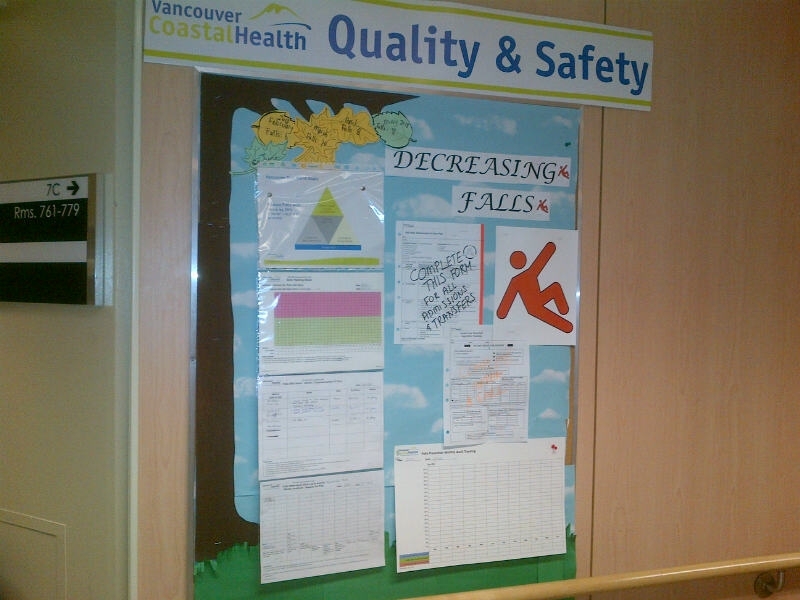 This May, VCH received official notification from Accreditation Canada that their new falls prevention program met all the deficiencies previously identified in 2012. 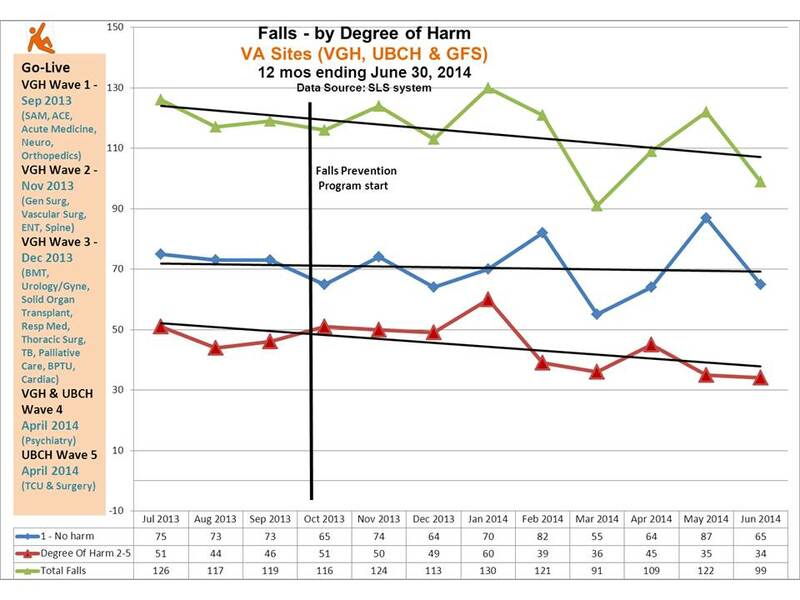 Since April 2014, chart audit data shows that VGH is consistently assessing more than 85% of their patients for fall risk on admission. UBCH has been assessing more than 95% of their patients. These results reflect the process improvement from implementing the new “Toolkit” on BC PSLS Falls data for VA sites. Joan says that initially there was a ‘spike’ in the number of falls reported in BC PSLS as each unit applied the Toolkit contents. With the Toolkit and standard falls prevention processes built into daily care throughout VCH, both Tanya and Joan say it will be important to maintain momentum and keep staff engaged in falls prevention goals over the long term. The team is currently embedding support systems for staff to help sustain all of the great work that has been accomplished so far. Ongoing meetings with the VA Falls Prevention Working Group are underway, a new Vancouver Integrated Falls Prevention Committee will bring staff together from across the care continuum to look at transitions between services, and most importantly, there is ongoing accountability and communication about falls injury and chart audit data. In 2016, VCH will undertake their next accreditation survey, so they will need to be ready. And the Clinical & Systems Transformation (CST) project will transform the delivery of health services at VCH, Provincial Health Services Authority (PHSA) and Providence Health Care (PHC). The new Toolkit and the Falls and Injury Prevention Guideline for Acute Care have been invaluable for directing the falls prevention components of the CST project. Tanya Dunne is the Regional Program Lead for the Regional Fall & Injury Prevention Program at Vancouver Coastal Health (VCH). She first joined the regional program as a Project Manager in 2008 and then took on the role of Regional Program Lead in 2012. Tanya is also a registered physical therapist who has worked in a variety of acute and residential care settings both in Canada and in the United States. You can email Tanya at tanya.dunne@vch.ca. Joan Chocholik is a Project Manager for Special Projects at Vancouver Acute. Prior to this role, Joan was the Patient Services Manager for the TCU/Medicine unit at UBC Hospital. You can email Joan at joan.chocholik@vch.ca.